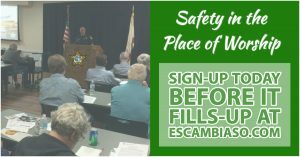 The Escambia County Sheriff’s Office is offering a free training opportunity to help places of worship consider the security needs of their facilities and operations. The training is designed for anyone responsible for the safety of their place of worship and will help attendees to understand the challenges and needs of worship security. The goal is to make the process of creating a secure environment easier, less expensive, and more effective. Questions contact Lisa Parrish at (850) 436-9735 or email for additional information.